If there is one decorative piece of furniture in our apartment that will always be a part of our home style, it's this bar cart. I bought it from Target about two years ago after Christmas to fill the empty space that was leftover from our Christmas tree and it has made it through our last two moves! 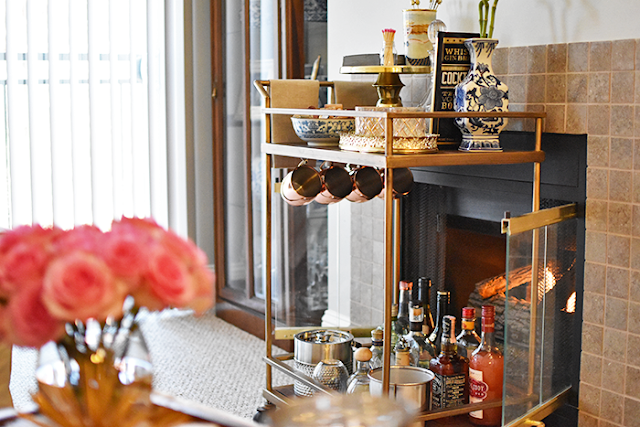 I love that it's a fun and easy way to add your own personal style to your space while still being totally functional. 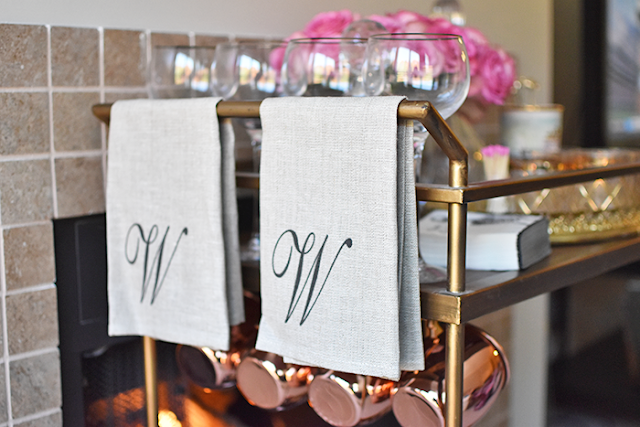 We obviously use our bar cart in the traditional way to hold our alcohol and barware, but if that's not your thing, I've seen a ton of cute ideas to use them as a coffee cart or as a cute way to set up desserts and sweets for a party! Most of the time, our bar cart is set up for everyday use and holds all our alcohol (minus my wine - there's a whole rack for that! ), the most commonly used glasses, and more decorative items. I love using trays to separate glasses and repurposing either old candle jars or cups to hold matches, straws and stir sticks. 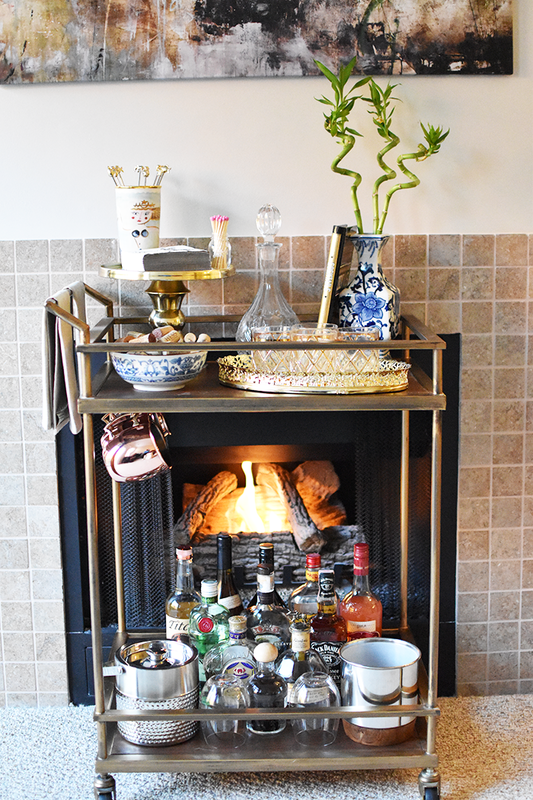 Most of the things on our bar cart are either thrifted, repurposed, from Home Goods, or were wedding gifts. I love that it's the perfect little mix of all the styles I like and instantly draws people's attention when they walk in the apartment! 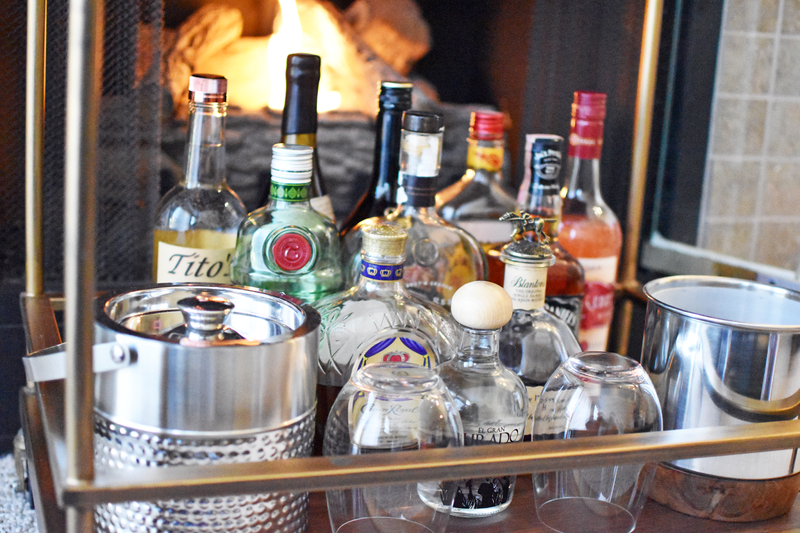 When we have people over for a gathering or dinner party, I like to pick a few signature drinks to focus on and remove most of my decorative items. This helps maximize the available space on your cart to make drinks and people aren't trying to decide what to have or ask for a mixer or ingredient you might not have on hand. My favorite signature drink as of late has been a Moscow Mule - how can you not love the copper mugs they come in?! 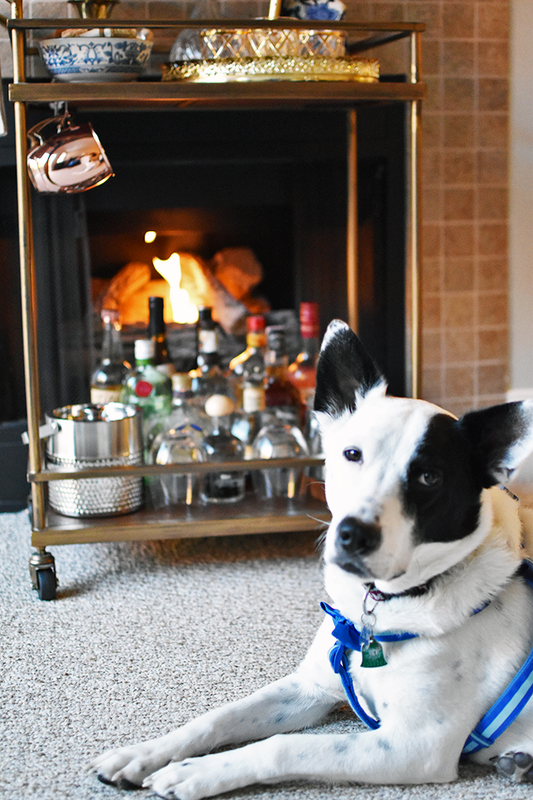 - and I also love doing a whiskey & wine night! If you're getting ready to stock your bar cart, or have the itch to redecorate it, here are some of my tips to maximize the style and functionality! The types of alcohol that I always keep on hand are whiskey, tequila, gin, vodka, rum, champagne, and a white and red wine. These are the most commonly used in drinks and most requested! Don't be afraid to mix your metals! 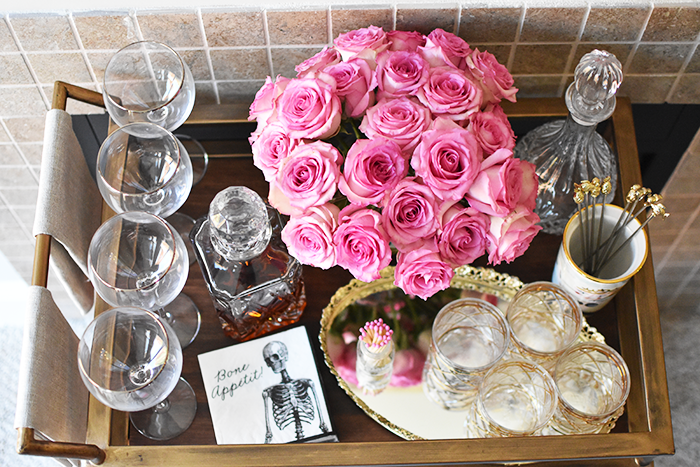 I have a silver ice bucket, gold trays and copper mugs and love that I can add anything without worrying about matching. I love adding a plant or some flowers to the cart because it brings life to not only your cart but the whole room! The most commonly used bar tools on our cart are a bottle opener, a corkscrew, and stir sticks. I love the look of all the fancy tools, but haven't found a huge need for them yet. Adding hooks or racks to the underside of your cart are an easy way to add more space, I just added hooks for our copper mugs. 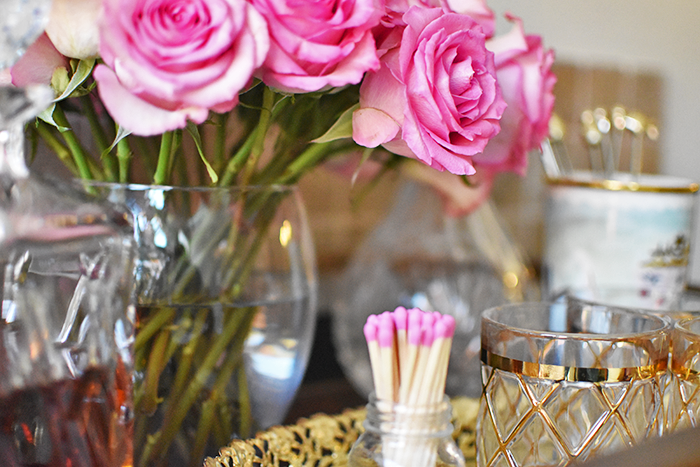 Straws and cocktail napkins are an easy way to add a festive element (like the ones I had for Halloween)! 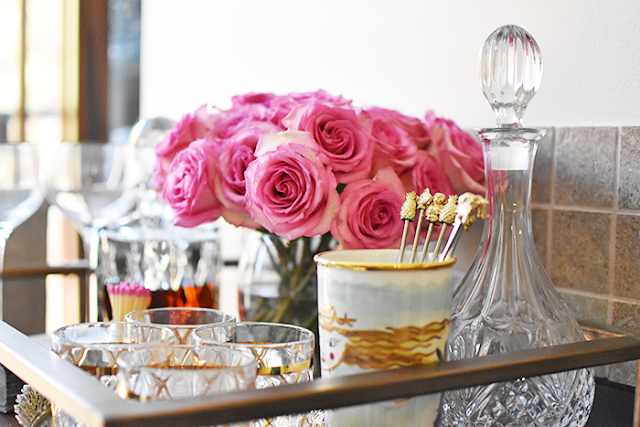 At the end of the day, don't stress out over making every little detail of your cart perfect! It should be an easy and fun way to express your style, and as long as it works for you and your needs it will be definitely be fabulous! We're officially half way through the week, and I think that deserves a little recognition so go ahead and treat yourself!